I love cookbooks. That should be obvious. Some cookbooks are mostly for browsing and reading and inspiration. Some cookbooks are mostly fantasy. The recipes look fantastic, but I'm never going to go make them. Some books are there for the technical information. How long do I need to roast that beast? What's the correct ratio of salt to water for that brine? What are those buttons for on that appliance, anyway? Some book are there for recipes, when I need them. Like for cakes and cupcakes and cheesecake. Oh, I've invented my own. But sometimes it's nice to open a book and know that someone else has done the math for me. 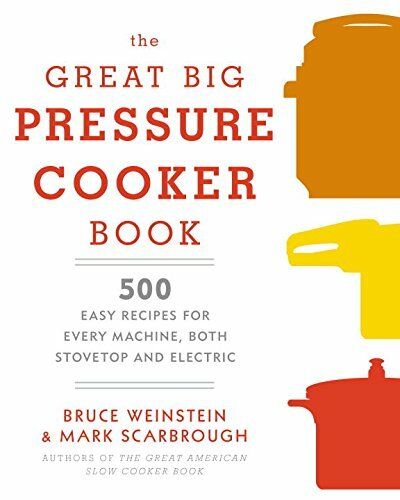 And then along comes a book like The Great Big Pressure Cooker Book by Bruce Weinstein and Mark Scarbrough. First and foremost, it's a recipe book. I've made several recipes from it, and I've got more on my agenda. I've liked everything I made, and there are many, many more that fit my lifestyle. It's also an appliance-specific book. It's all about working with pressure cookers, but unlike most (all?) of the other pressure cooker books out there, this one has instructions for both stovetop and electric pressure cookers, which is pretty darned awesome. I have a couple other pressure cooker books, and I mostly use them to see how long I need to cook something, and then I use my own recipes ... but with this book, I'm pretty likely to try the recipes rather than wing it every single time. Another great thing is that it's not just the usual soups, stews, and braises that are typical for a pressure cooker. Next on my agenda is a cheesecake recipe. It's hard to say which recipe I liked the best, but the Ground Beef Chili was a winner, for sure. I'll be making it again, no doubt, and there's a good chance you'll be seeing the actual recipe over on Cookistry very soon. Just for fun, here's a photo of the chili. Looks good, right? The only thing that I need to mention is that I live at high altitude, so for most of the recipes I've tried, I've needed to add just a little more cooking time. This isn't a flaw with the book, it's simply a way of life up here where the air is thin and water boils at 202 degrees.